This Gin uses juniper grown only in Veliki Preslav, or Great Preslav, a town in the Shumen Province of North East Bulgaria. The town is found at the foot of the Stara Planina Mountain (part of the northern Balkans), with the surrounding countryside providing an ideal habitat for juniper to grow. 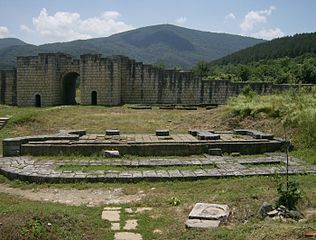 It has a population of around 10,000 and was the ancient capital of Bulgaria from 893 to 972 AD. A fortress was built during this time and housed the Royal Palace of Prince Boris the First, becoming one of the most important medieval centers of Europe. Today the ruins of the 1,000+ year-old fortress is a protected historical/archaeological reserve. On the nose is green pine (herbal juniper) and floral grassy notes with fruity citrus (lemon) and a hint of pepper. On the palate this lightly sweet spirit has clear floral juniper with citrus (lemongrass), some report a waxy flavor to the Gin but we haven’t found this ourselves. On the close is a short bitter mouth tingly earthiness with hints of pepper and chocolate. This is lifted all round with a clear spiciness, more juniper and heightened sweetness by the addition of the botanicals. This is a strangely green floral (spring meadow) featured juniper forward Gin with a little harshness at the end making it unusual to drink neat and so we believe it is best reserved for mixed drinks. It makes a refreshing Gin & Tonic and is best with a slice of lemon garnish; it is best of all with the spicy addition of the botanicals. This makes a nice creamy fresh dry Martini and again is lifted and improved by the addition of the botanicals. In an Aviation the floral notes work well, we experimented further by making an Aviation cocktail with a 50/50 combination of this Gin and the aptly named Aviation Gin, the result was really nice. This is clearly a versatile Gin with the added botanicals. Well, as they say in Bugaria, it’s “Dovizhdane” (Slavic for “goodbye”) for now.